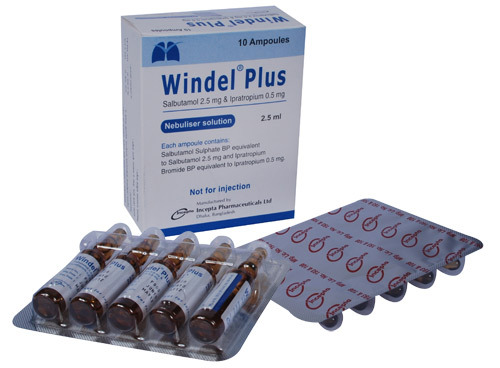 Windel® Plus: Each ampoule contains 2.5 ml isotonic, clear solution for inhalation of salbutamol sulphate BP equivalent to Salbutamol 2.5 mg and Ipratropium Bromide BP equivalent to Ipratropium 0.5 mg.
Windel Plus contains two active bronchodilating substances, Salbutamol Sulphate and Ipratropium Bromide. Salbutamol Sulphate is a beta2-adrenergic agent which acts on airway smooth muscle resulting in relaxation. Salbutamol relaxes all smooth muscle from the trachea to the terminal bronchioles and protects against all bronchoconstrictor challenges. Ipratropium Bromide is a quaternary ammonium compound with anticholinergic properties. In preclinical studies, it appears to inhibit vagally mediated reflexes by antagonising the action of acetylcholine, the transmitter agent released from the vagus nerve. Anticholinergics prevent the increase of intracellular concentration of cyclic guanosine monophosphate (cyclic GMP) caused by interaction of acetylcholine with muscarinic receptors on bronchial smooth muscle. The bronchodilation following inhalation of Ipratropium Bromide is primarily local and site specific to the lung and not systemic in nature. Windel Plus provides the simultaneous release of Ipratropium Bromide and Salbutamol allowing the synergistic efficacy on the muscarinic and beta2-adrenergic receptors in the airways to cause bronchodilation which is superior to that provided by each single agent and with no potentiation of adverse events. Windel Plus is indicated for the treatment of reversible bronchospasm associated with obstructive airway diseases in patients who require more than a single bronchodilator. Windel Plus inhalation solution in ampoule may be administered from a suitable nebuliser or an intermittent positive pressure ventilator. Adults (including elderly): One ampoule as required for the relief of symptoms or as directed. Up to three to four ampoules daily. Patients should be advised to consult a doctor or the nearest hospital immediately in the case of acute or rapidly worsening dyspnoea if additional inhalations do not produce an adequate improvement. Adverse Effects: In common with other beta-agonists containing products, side effects of Windel Plus can include fine tremor of skeletal muscles and nervousness and less frequently, tachycardia, dizziness, palpitations or headache, especially in hypersensitive patients. Potentially serious hypokalaemia may result from prolonged and / or high dose beta2-agonist therapy. As with use of other inhalation therapy, cough, local irritation and, less commonly, inhalation induced bronchospasm can occur. As with other beta-mimetics, nausea, vomiting, sweating, weakness and myalgia/muscle cramps may occur. In rare cases decrease in diastolic blood pressure, increase in systolic blood pressure, arrhythmias, particularly after higher doses, may occur. In individual cases psychological alterations have been reported under inhalation therapy with beta-mimetics. The most frequent non-respiratory anticholinergic related adverse events are dryness of mouth and dysphonia. There have been isolated reports of ocular complications (i.e. mydriasis, increased intraocular pressure, angle-closure glaucoma, and eye pain) when aerosolised ipratropium bromide either alone or in combination with adrenergic beta2-agonist, has escaped into the eyes. Ocular side effects, gastrointestinal motility disturbances and urinary retention may occur in rare cases and are reversible. Although there is little published evidence of the safety of combination of Salbutamol & Ipratropium Bromide in the early stages of pregnancy, the individual active ingredients, Ipratropium Bromide and Salbutamol have been in widespread use for many years. No suspect teratogenic factors have been observed in general practice or clinical studies. As a general precaution, however, Windel Plus should only be used in pregnancy and during the lactation period if the expected benefit to the mother is greater than any possible risk to the child. Windel Plus should be used with caution before childbirth in view of Salbutamol's inhibitory effects on uterine contractions. Salbutamol Sulphate and Ipratropium Bromide are probably excreted in breast milk and their effects on neonates are not known. Although lipid-insoluble quaternary bases pass into breast milk, it is unlikely that this will happen to any extent especially when taken by inhalation. However, because many drugs are excreted in breast milk, caution should be exercised when Windel Plus is administered to a nursing woman.